One of my oldest and dearest memories of concerted completism is getting a complete score with all three character classes in Quest for Glory I (or Hero’s Quest, as it was called at the time). The maximum score was 500 points, and through careful note-taking, I noticed that 450 of those points could be earned by any class. 50 being a nice round number, I reasoned that the last few points had to be earned through class-specific actions. Anyone could beat up a goblin, but only the fighter earned points by doing so. In addition, I noticed that for two of the classes, I had earned a large portion of the 50 class-specific points by besting a master of that class at some challenge, and realized that the third should be looking out for a similar challenge. Quest for Glory 5 aids such analysis by tracking your “deeds”, a list of everything you’ve done that earned points. In other words, it’s like the “fullscore” command in Inform games, except that it doesn’t say how many points things earned. (And in some cases I can’t tell even from observing how much my score went up; sometimes two deeds happen together.) Anyway, it’s always nice to see graphic adventures catching up to features that are commonplace in text games. The deeds list is a little sloppily put-together, with some things recorded incorrectly — monsters have different names and the like. Well, scoring is usually an afterthought in adventures. This list is pretty definitely more important to me than it was to the game’s designers. The games in the series have certain common practices in scoring. Wherever in the world you are, there’s always a few points to be earned by signing the logbook in the Adventurer’s Guild. Getting an item that’s necessary for solving a non-optional puzzle always gives you points, which is handy for winnowing out the really important stuff in shops. If you play as a fighter — which I still am, despite starting over and thus having a clear opportunity to pick a new class — you get a few points for each distinct type of monster you slay — gotta kill ’em all! And that last part is affecting how I’m playing this game in a way that the authors didn’t intend. This relates to what I was saying before about timing. I’ve done some experiments by staying in my room and sleeping for weeks at a time 1In the game, I mean., and it looks like I was right: there are no negative consequences for starting the Rites of Rulership later. Since I know there are negative consequences for not being able to complete the tests quickly enough, I want to get as much of the game done as I can before I start the clock ticking. Obviously this includes getting the Fighter’s class-specific points for big game hunting. Some of the monsters are tough, but no match for my ability to pop healing pills during battle. (The world will be doomed once the monsters figure out that trick). Some are rare and hard to find. All would be easier to kill if I had access to the magical weapons that you can only buy after you enter the Rites. But I think I’ve klled everything that’s available to be killed before the Rites open up new areas. And I really wasn’t supposed to. I think of my experiences with QfG1. There was no compulsion on the player to complete events within a certain timeframe, so I basically just tried to kill things as I encountered them over the course of traipsing around and trying to solve puzzles. It was an unstructured melange of puzzles and combat. Whereas QfG5 gave me just enough motivation to segregate the two realms. Part of the strength of QfG1 was the way that the two aspects of the game complemented each other — that you could go grinding when you were stuck on puzzles, and puzzling when you were tired of grinding. In some cases, if you couldn’t solve a puzzle the clever way, you could exercise your stats to the point where you could overwhelm it. But I’m going to miss all that in this playthrough. I’ll just have to save the clever stuff for when I play as a Thief. 1. ↑ In the game, I mean. 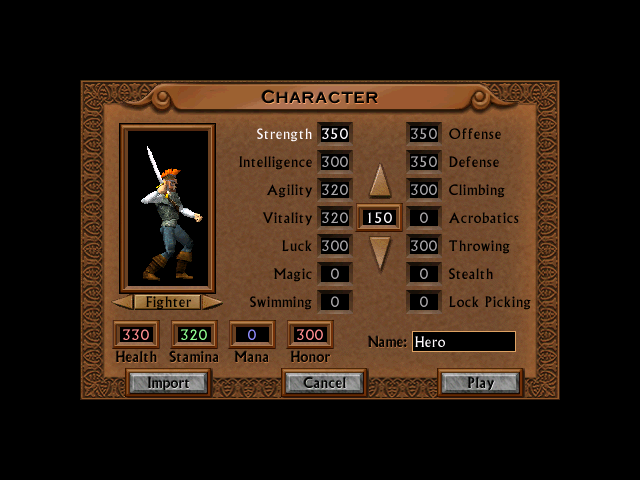 In a CRPG, the player’s focus is on going through the motions. There may be puzzles to solve and tactics to figure out, but these are usually stuck into a context of grinding. Progress in one of these games doesn’t necessarily present any challenge at all to the player beyond investment of time. You lose that investment if you start over, or even just go back to an earlier save. So it says something about which aspect of Quest for Glory V is dominant that I started over without really needing to. I had managed to reach the point in the plot where Magnum Opus gets murdered a couple of days before I was scheduled to duel him in the arena, thus cheating myself out of the five points (out of a maximum 1000) that I would have gotten for trouncing him. I’ve been saving the game at the start of every in-game day, and thus could have figured out what the last point was that I could have salvaged this, but nah, that’s too much effort. Better to start over. And, having started over, I’m doing things much more efficiently. A lot of the puzzle content can be taken care of on day 1 if you know what you’re doing, freeing up the rest of your time for maxing your stats — and, in fact, maxing your stats doesn’t take all that long either, so at this point I’m basically just marking time until I fight Magnum Opus. Eventually I’ll have to start the Rite of Rulership, and with it, the rest of the plot. But until I pull that trigger, the game seems to be in a plot-development-free zone. Whether this lasts forever or not, I don’t yet know. I was told at the beginning that my associates had paid my rent at the inn for a month, so that may be the point at which things come crashing down. On the other hand, the looming threat — the gradual destruction of the anti-dragon wards — seems to be dependent on plot events that only occur during the Rite, so I don’t know how the doom of the city would occur before then. Maybe it’s those invading mercenaries; maybe if I go and sleep at the inn for another couple of weeks without driving them off as part of the Rite, they’ll finally storm the city. But I doubt it. If I were any kind of real hero, I wouldn’t enter the Rite at all. Let the city stay in its starting state indefinitely, with the defenses intact and no additional murders. So what if they don’t have a king? These guys are pseudo-ancient-Greeks; they should be capable of inventing democracy. If I had to describe the overall style of the Quest for Glory series in one word, that word would be “goofy”. It’s got a mixture of heavy-handed drama and a twelve-year-old’s idea of what’s cool, topped off with a love of puns. Ye gods, the puns. There are a few characters who seem to exist mainly as agents of pun delivery, and even if you avoid those characters, the narrator sometimes indulges in them (chiefly in descriptions of scenery objects). Kokeeno Pookameeso, member of the city guard, always seen wearing one of those Grecian helmets with the brush-like crest. The only local in the running. Elsa von Spielburg, a baron’s daughter from QfG1. When last we saw her, she was a damsel under a curse. Now, she’s a duelist in thigh-high boots and revealing armor. 1Actually, it’s not any more revealing than the getup worn by Kokeeno Pookameeso or Magnum Opus. But, y’know, double standard. Magnum Opus, a Roman gladiator with a very high opinion of himself. Roman? Well, he mentions “Nova Roma” at one point, so maybe it’s fantasy-pseudo-Rome. But we’ve had intrusion of real history into the fantasy world before, as when Haroun al Rashid showed up in QfG2. Anyway, Magnum Opus is an exaggeratedly one dimensional character, prone to saying things like “I, Magnum Opus, the valiant, peerless spearman of the Roman Empire, shall prove the superiority of my skills” regardless of the topic of discussion. Gort, a Frankenstein-like construct created by mad-scientists (in 19th-century attire) on an artificial island. Although Gort is probably the strongest fighter, it’s questionable how effective a king he’d be, seeing how he can’t talk. So, not something you can take too seriously, despite aforementioned ham-fisted drama. But while I call the style goofy, I will not call it cheesy. The difference? It’s really all down to the authorial voice. When the author gives the impression of being stupid or incompetent, we naturally make a mockery of both the author and the work. But however goofy QfG gets, I get the impression that the author is just having fun with it. Things like Gort are so extremely out-of-place that they pull you out of the fiction for a moment, like Tezuka’s gourd. And it isn’t ironic detachment, either: once the author and player have acknowledged the absurdity, the characters in the world have to take Gort seriously. It’s their world, after all. And since the player is controlling one of the characters, it is to some degree your world too. 1. ↑ Actually, it’s not any more revealing than the getup worn by Kokeeno Pookameeso or Magnum Opus. But, y’know, double standard. My goodness it’s been a while since I posted anything. I blame the spring weather. (In February? Yes. Apparently that’s when Spring comes in San Francisco.) But also I blame the poll experiment. One of the central things that keeps games enjoyable for me is that they’re one of the few things that no one wants me to do. There are no external obligations, just the obligation to the game itself. The Oath works against this a little, but I was careful to set that up so that I was never actually obliged to play anything — just to blog about it if I do. Letting other people choose what I play is another thing altogether, and so I don’t think I’ll repeat it. Now, as to where we left off: By now, I’m pretty well into the swing of QfG5, having achieved about 40% of the maximum score. This is the sort of game that has an accelerated realtime day/night cycle (sped up by a factor of something like 30, or faster on the overland map), with some things refreshing themselves with new content each day. It’s important in this sort of game to get into a daily routine, something that lets you patrol all the major areas for daily developments, but still allows you some free time every day for questing. The Quest for Glory series has varied a lot on the matter of timed plot events. QfG1 basically didn’t have any at all — you could spend as long as you wanted grinding for better stats and take care of the story when you felt you were ready. QfG2 went to the opposite extreme: most of the game, from the very beginning, consisted of a series of looming emergencies that would end the game if not handled in time. The rest of the games, as near as I can remember, try to strike some kind of balance. In QfG5, once you enter the Rite of Rulership, it imposes a certain amount of urgency on your actions. The Rite is basically a series of competitive quests, and if you don’t complete them quickly enough, one of the other candidates will beat you out. But if that happens, it’s not the end of the world — and more importantly, it’s not the end of the game. I’ve been taking care to win every event (it isn’t all that hard), but I have to wonder what happens if you just throw them all. Does the final save-Silmaria-from-ultimate-destruction event count for more than the rest of the events put together, like last-minute house points for Gryffindor? Or can you be a hero and still not become king? It’s interesting to compare this to the last competitive quest in the series. 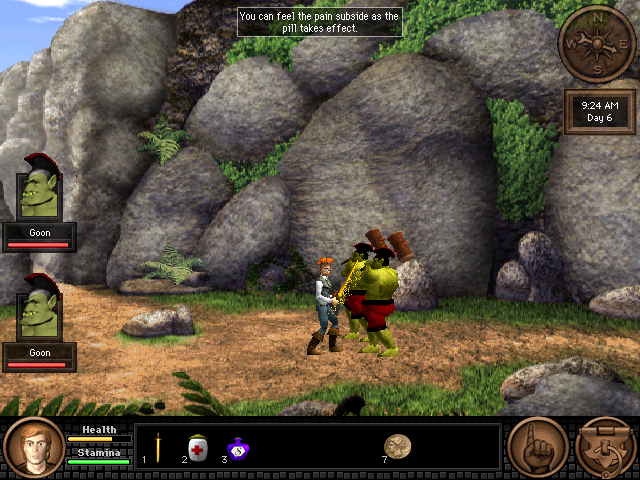 At one point in QfG3 (the one in the pseudo-African setting), the hero has to prove his worth as a warrior by engaging in a sequence of challenges against another warrior candidate. One of the challenges is a footrace. The opponent stumbles and falls during the race, and if the player has a choice: stop to help him, or take advantage of his misfortune to win the race? The right solution is, of course, the former, which nets you more points and more Honor (key if you want to become a Paladin). If you just keep running, the opponent straightens up and overtakes you anyway. The message there is pretty clear: competition is all very well, but doing the right thing is more important. So how does that notion fit into the present game? Here, I’m awarded extra points for putting the competition above more important concerns like finding out who poisoned the king. Arguably, the rite is more important than those mere sporting events in QfG3 — the organizers are pragmatic enough to turn the first two tests into repel-the-invading-mercenaries competitions. But that line of argument merely suggests that the hero should be participating, not necessarily that he should be playing to win. Will there be a showdown where the hero has to make the same decision as back in Pseudo-Africa, a choice between going for the win and doing the right thing? Or has that moral just been tossed to the wind? I can’t yet say. I’m a bit late with this post, but: the latest trading opportunity was foiled by defective cabling. Every episode in the Quest for Glory series starts by giving the player a choice of three character classes: Fighter, Mage, and Thief. (From episode 3 onward, there’s a fourth character class, Paladin, but you can’t choose it at the beginning of the game. Paladinhood must be earned.) You choice of class affects not only how you deal with monsters, but how you can solve certain puzzles. There’s also class-specific content: guilds with their own tests, houses for the Thief to burglarize. All in all, it’s one of the most effective replay-value mechanisms I’ve seen. And yes, I have played through episodes 1 through 4 with every class. 1I have to admit, though, that part of the reason I played the first couple of games with every class is that I was just a kid then, without a Stack of 300+ games, and thus was more motivated to milk every drop of gameplay I could from those games I owned. Really, this whole blog is a holdover from that now-obsolete mindset. Generally speaking, the Fighter is the simplest class to play: whenever a puzzle has class-specific solutions, the Fighter’s solution is to break it. For that reason, I’ve been playing QfG5 as a Fighter so far. If I get completely stuck, I’ll give one of the other classes a whirl, and probably learn something to help the Fighter in the process. But that hasn’t happened yet. Playing the Fighter means I have to use the new combat system a great deal, and it has some problems. See, combat is realtime — in a sense, the game isn’t just an adventure/RPG hybrid, it’s an adventure/RPG/fighting game hybrid. You can do simple maneuvers with the mouse, Diablo-style, but if you want to use more than one kind of blow, or dodge sideways when your opponent strikes and counterattack, or even just block with your shield, you need to use the keyboard. The problem is that the game frequently drops keyboard events. I wouldn’t even mind this so much if it just dropped key presses, but it often fails to recognize key releases, leaving me endlessly dodging in a circle or whatever until I mash the key that triggered it a few times. So I’m pretty much stuck with the mouse. The fighter can pretty much just bash through things without fancy footwork, given enough healing items (and healing items are really cheap in this game), but there are some monsters that are patently designed to be handled with more finesse. The Goons, for example: big green guys with huge mallets. 2There was a Goon in QfG1. There, it was an invincible guard, something that ended the game abruptly without a combat sequence if it caught you. The fact that the hero is taking on whole packs of them now is a pretty clear sign to the fans of the series of how far he’s come. They hit hard, but their blows are kind of slow, and I could use that against them if I had access to the moves I’m supposed to have. I wonder if the other classes will have it better or worse in that regard? On the one hand, in close combat, they’d be more reliant on dodging. On the other hand, they’re also more geared toward avoiding close combat. 1. ↑ I have to admit, though, that part of the reason I played the first couple of games with every class is that I was just a kid then, without a Stack of 300+ games, and thus was more motivated to milk every drop of gameplay I could from those games I owned. Really, this whole blog is a holdover from that now-obsolete mindset. 2. ↑ There was a Goon in QfG1. There, it was an invincible guard, something that ended the game abruptly without a combat sequence if it caught you. The fact that the hero is taking on whole packs of them now is a pretty clear sign to the fans of the series of how far he’s come.